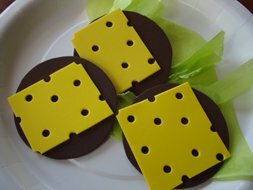 This Swiss Cheese and Crackers craft is a fun project for young children learning about Switzerland, and they make great play food as well! Yum, Yum! 1. From your foam cut circle cracker and square cheese shapes. 2. Make holes in your Swiss cheese with your hole punch. You can glue the cheese to the crackers and the crackers to the paper plate - or, you can leave them unglued if the kids want to play with them! We put some green tissue paper on our plate to look like a lettuce garnish.